So how should corporations engage with startups, and what pitfalls should they avoid? Based on our interactions with corporations of all sizes and from all industries, we see engagement models that work well and others that leave room for improvement. We summarize our key findings in three themes here. EDUCATE: Gain a broad understanding of an emerging market’s scope and activity, and define your corporate objectives in response. 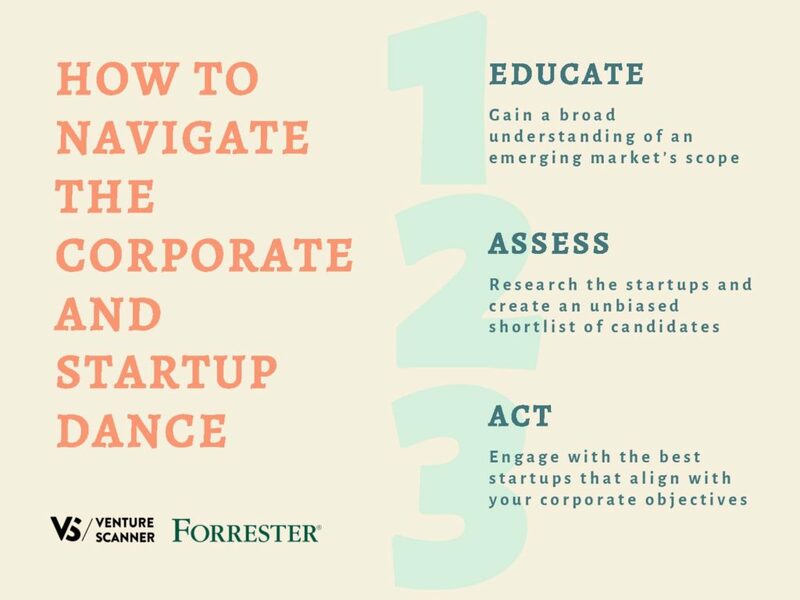 ASSESS: Research the startups that compete in the market, and create an unbiased shortlist of candidates based on your corporate objectives and investment parameters. ACT: Engage with the best startups that align with your corporate objectives and desired business outcomes. Oftentimes when a corporation looks to make an innovation play or a financial investment in a particular category, the immediate impulse is to reach out to startups that they have seen repeatedly in the media. Similarly, the corporate “scout” might reach out to venture capitalists or an accelerator in their network, which by design leads to biased referrals. Other paths may include sponsoring an incubator or arranging a Silicon Valley tour. All of these tactics limit your exposure to the startups within your network and thus cloud your view of the market as a whole. And while they may help spark some innovation inside an enterprise, they by no means remove the hard work needed to gain a complete picture of an emerging market. The absence of that broad perspective will introduce risk into your process, whether you’re looking for M&A, equity investments, or strategic partnerships. When done right, this step with foundational market intelligence sets the stage for the mission-critical decisions that follow. Understanding an emerging market is one thing, but narrowing a field of hundreds — if not thousands — of startups down to a manageable shortlist for your objectives is hard to do. The key to the shortlisting process is to avoid bias. The inputs into this step should include your unique corporate and product strategy, as well as the startup characteristics that will best align to that strategy. As part of this filtering process, it’s wise to conduct interviews with startup candidates to gain a deeper understanding of their product road maps and sources of differentiation. Most organizations are not well resourced for this, so an objective partner is invaluable. The output of this step is a shortlist of startup candidates based on an unbiased process that brings to the forefront the companies that have the strongest strategic fit. Once a firm shortlist of startups has been established, it’s time to move into the action phase. At the core, corporations and startups have very different cultures. Large companies are typically process-heavy and exhibit an overabundance of caution. To a startup, large companies can seemingly spend an enormous amount of time and resources on analyzing while showing little to no signs of acting. On the other hand, startups are resource-constrained, so they must invest those resources only in places that can lead to immediate traction as measured by revenue, customer growth, or the next round of funding to keep their nascent business afloat. Therein lies the major challenge. In order for startups to justify spending time with a corporation, they will want to see skin in the game. Whether it be by becoming a paid customer, engaging in a paid proof-of-concept partnership, or some other commercial relationship, a startup will take the corporate partner who takes real action seriously and will be quick to shy away from those who want to spend endless hours in meetings without taking action. Corporations that make early bets on startups will gain the loyalty of the startup as their company and product mature. Startups will treat such corporate partners like family, for they not only took a risk, but they did so with skin in the game that did not guarantee a future return. The common ground in these situations is typically the “fail fast; fail cheap” mantra. So if you think you spot a startup that can give your corporation a competitive advantage, think through the three steps above, and answer these key questions: Are you sure you’re starting from a broad understanding of the market? Are your information sources unbiased and credible? Are you willing to engage with a sense of urgency and take meaningful action? These are critical considerations as you attempt to drive profitable innovation inside your organization. The future success of incumbent corporations across all industries rests on their ability to successfully monitor, assess, and engage with an increasingly chaotic startup and innovation ecosystem. We are excited to announce that Forrester and Venture Scanner have formed a strategic partnership to help you in every step of the process. To learn more, join us at our upcoming podcast in November, or reach out to Carl Doty (cdoty@forrester.com) and Nader Ghaffari (nader@venturescanner.com).